I still recall my very first lecture and my very first assignment at The University of Auckland. After transferring from a practical, secure science major with abundant job prospects to an arts degree in English Literature, many people probably thought I had completely lost my mind. And who could blame them? While at home in Yorkton, I came across this exegesis I had written as part of my first creative writing assignment. We were required to assemble a portfolio of work encompassing the four genres of writing we had studied (poetry, multimedia, short fiction and screenplay). My multimedia, due to its personal relevance, never fails to reconcile my belief that I made the right decision to pursue an arts degree. “The experience of living abroad has substantially transformed my goals and perspective. Being a Canadian in New Zealand is simultaneously rewarding and frightening, as I aim to communicate through ten paintings (four of which are present before you now.) I have photographed (and attached images) of the six additional paintings in places that demonstrate my familiarity with displacement. They are not being presented to you in one piece (or at the same time) because they are relentlessly in transition, much like myself. I have not settled in one country, but regularly travel back home while continuing my studies at the University of Auckland. Keeping the paintings together would contradict their fundamental purpose of illustrating my longing for each country, and the chaos I endure when absent from either. As I embark on a lengthy journey, I hold a painting depicting Saskatchewan’s wheat fields that extend along each highway. Following twenty-four hours of travel time, I will land in Saskatoon on Saturday afternoon. Shortly after emerging from the airport, this art work will be photographed at my destination. The painting featuring a runway and an airplane taking flight will be photographed from outside a window at the Auckland International Airport prior to the first leg of my travel itinerary. This canvas is peering out at a world of possibility, establishing its place on this earth. Geographically, Canada and New Zealand sit exceedingly far from one another. In my heart, however, they are intimately connected. While I do not have family here, I have developed close relationships with many New Zealand citizens and fellow travellers who share my love for this place. The physical separation of these paintings is comparable to my personal displacement. Half of my heart will always remain in Saskatchewan, alongside my family and childhood friends. The other half belongs in New Zealand, representing my desire of not being confined to what is familiar and recognizable. 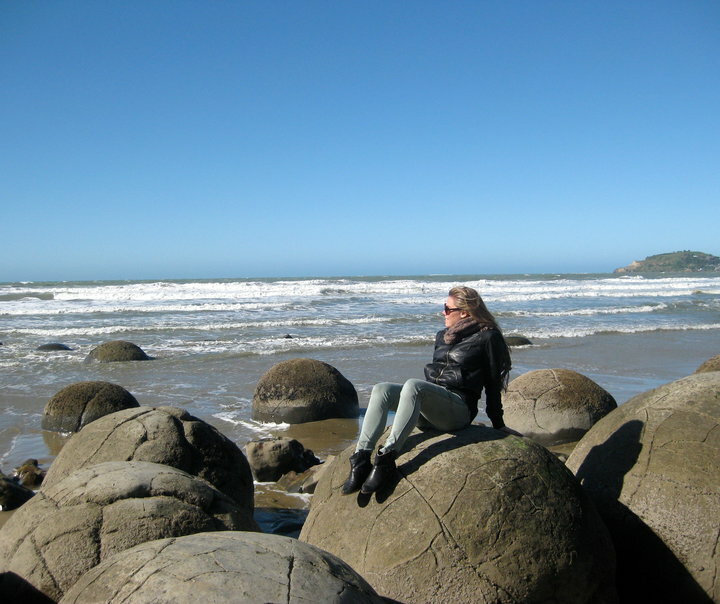 The displacement began in 2009 when I initially visited New Zealand on a study abroad exchange. The graffiti exercise presented during tutorial inspired the use of placement and exposure in my work. I decided to photograph my paintings across two continents to demonstrate the extent to which an idea can travel. With each kilometre travelled, the paintings evolve, and develop new and exciting connotations. The mapping exercise conducted in tutorial was equally effective. It enabled me to expand on the idea of a traditional map. Scattering paintings throughout the Southern and Northern Hemispheres manifest distance and displacement on a realistic and larger scale. Additional inspiration came from Allen Say’s Grandfather’s Journey, one of my favourite pieces of children’s literature. Many of the themes present in this story, cross-cultural experiences, intergenerational relationships, and family history are personally relevant.